The King intends to appoint a new Master for his vineyard and wishes to discover which apprentice has the cleverest way with grapes. The wily King will pay three surprise visits, judging the grapes for color, sweetness and vine length, dispensing gifts of goblets, bottles and barrels to demonstrate his appreciation. After the final visit, the apprentice with the most valuable gifts will become Master of the King’s Vineyard. 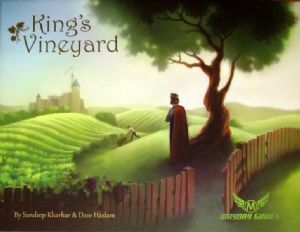 Players vie to impress the King who judges each vineyard according to the number of ripe grapes, adding bonuses for sweetness, fruits of the same color, and the uniformity of the vines. At the end of each royal visit, players tally their scores and collect the King’s gifts as point tokens. At the end of the game the player with the most points wins.